What makes fixed income a bad investment? Neither look good for the longer-run. Yields are not going to help with fixed income this year. First, the level of yields is low. Hence, there is less cushion associated with any fixed income security. The duration of any bond for a given maturity has lengthened given the lower coupons. Second, the yields are below current inflation rates for many maturities. There is no real return and any movement back to a real positive yield will mean higher absolute yields which will be bad for total return. If rates, however, stay the same with current inflation, investors are getting a raw deal. The duration effect for total return is based on the ability of yields to fall. There is less room for rates to fall hence duration gain will be limited and one-sided. Clearly, the increase in rates over the last six months have made new trades better but there is still limited gains with 10-year yields just below 2% and 30-year at just over 3%. The environment is poor given financial repression. 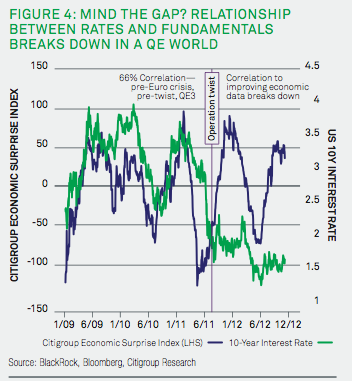 This interesting chart from Blackrock shows there is less connection between fundamentals and rates. The search for yield and return has matched the expansion of money but the recent talk about exit strategies can easily spook the market. Currency intervention - who is in and out? The week has shown that there is an increase in active exchange rate intervention and talk about governments moving FX rates. This is just a short list but shows how the markets are being driven by active government action. The currency wars are being fought all over the world but not with the US. Brazil - less direct intervention and fight of capital inflows but inflation fighting now underway - issue of whether exchange rates will be a tool in this inflation fight. How do you get better farm productivity? Create clear property rights on who who owns the farmland. Common ownership or socialism in farming has never worked. The collective is good in concept but does not provide the drive to take risks and produce product. With greater food needs, the only solution is getting more from the same resources and providing clear ownership rights is the clear path for success. Current China farm policy is trying to provide clear title to farmland. Most households do not have clear documentation and providing well-defined title may rectify one of the vexing problems in rural areas. If small farms can be aggregated, more economies of scale can be created. Satellite mapping is being used as tool to help this process. With increasing food imports, there is a sense of urgency with this project. This is a long-term project worth watching. Behind the rise in farm prices is the strong grab for land. It is happening in the US, South America, Africa, and the steppes of eastern Europe. This is the result of lower supplies and the expectation that population growth is not going to abate. Don't buy building or housing, buy producing land. With interest rates low, the cost of financing land purchases is low. Buy farmland, develop it, and you have a greater inflation hedge and productive asset with potential high returns. Now farming has traditionally been very volatile but those flush with cash will find this a great potential opportunity; however, prices are matching all time high is many areas. The question is whether this is good for the farmers especially in developing countries where property rights are unclear. Corporate farming has never been good for existing small landholders but it is a way to solve consumer problems. So what is more important traditional farming or feeding the masses? We may not be able to have it both ways. All of this is very standard intervention rhetoric. You may not agree with the criteria but this is how an activist central bank would answer the question of whether intervention should take place. The second shoe is what he said next which caused a market stir. The term of trade are 20% higher than the 1990's. The real equilibrium exchange rate is not reflecting productivity differential declines, REER is high versus dollar and FX movements correlate with terms of trade. What he may be saying is that the TOT are too high and do not reflect reality of productivity declines and there is a reason for intervention. The market took this to mean that intervention to bring down the kiwi is possible. When the market thinks that can happen, it will sent prices lower. The jump lower in the kiwi was immediate. If a central banker tell you his currency is overvalued, you better listen. The FOMC minutes released yesterday provide an vivid glimpse in the uncertainty across policy-makers. The minutes suggest that there is more uncertainty about how to best implement QE3 or even end it. Overall, there is no lock on the bond purchases of $85 billion until unemployment gets down to a certain level. There is no lock on easing policy for the next year. This will create a new level of uncertainty in monetary policy. Whether right or wrong, the market viewed that monetary policy was on a trigger, no end of easing until unemployment got down to 6.5%. That view has ended. With Pre-FOMC committee minutes the focus was on the monetary exit strategy some time in the distant future. There would be an end to bond purchases next year. There would be exit uncertainty, but that would be a problem for tomorrow and not for today. Now all of the exit and easing uncertainty has been pushed up to the immediate time-frame. There will be a significant focus on exit behavior at the March meeting. Long-term exit uncertainty has been compressed into tactical uncertainty on size and response in the near-term. This should end the low volatility trend of the last six months. There will again be more focus on Fed speeches, forward guidance, Bernanke signalling, and ultimately more risk-on risk-off trading. There has been much talk about the US becoming more like Europe. The data on employment does not show it. 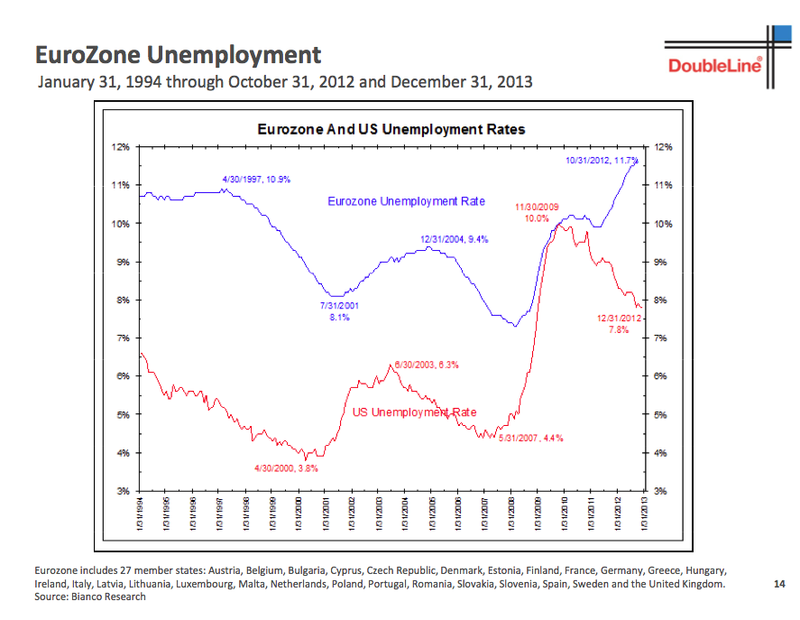 while both Europe and the US have been hard hit by the Great Recession, the response in labor markets is very different. There can be arguments on whether unemployment is a useful tool or measure of labor market structure, but the divergence between the US and Europe is notable. The US suffered more in the wake of the 2008 events, but the response has been much sharper. 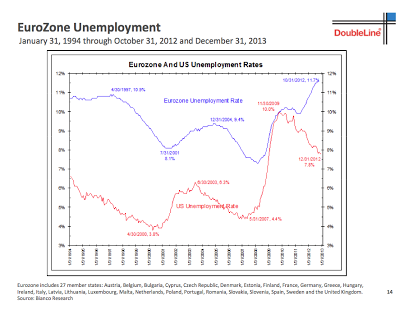 The US is seeing a declining unemployment rater while Europe is still moving higher. The sovereign crisis has much to do with this difference, but the crisis was an outgrowth of the Great Recession. 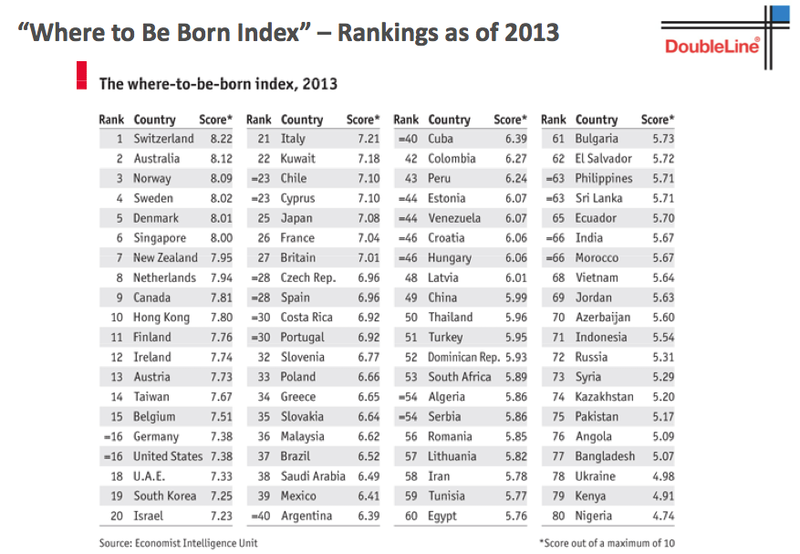 The "where to be born" index also shows a big change versus Europe. In 1988, the US was number one, but the current number shows that a good portion of Europe may be better off. 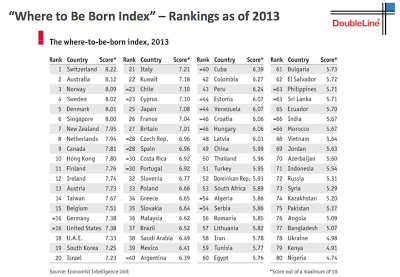 The index may again be suspect bu there is a difference between the US and Europe. Under pressure from Oxfam, the BNP has suspended subscriptions on two of its commodity funds. This was done after Oxfam released a report attacking some french banks over their exposure in food companies. Oxfam wants to stop speculation on commodities which will push food prices higher. Germany's LBB Invest banned soft commodities from its funds and LBBW Asset Management has also stopped investing in soft commodities. DB has set-up an internal task force to review price volatility on soft commodities. This is a unique pressure to close funds so that investors will not have access to commodities as an asset class. This could be considered the latest fight in the battle against speculators. This battle has been going on since the introduction of futures markets. There have been issues with speculators pushing prices higher and making food too expensive. There ave been issues with speculators driving food prices lower. The argument is that price volatility hurts small farmers so get those who could move prices out of the market. But what will be the fair price for these commodities? BOE Governor designate Mark Carney has put a lot of emphasis on forward guidance in talks today. He has used this effectively when he was at the Bank of Canada. The idea is simple and has been followed to some degree by the Fed. Tell investors what you are panning to do not just for today but for the longer-term. If the uncertainty is reduced, markets will adjust faster. It will provide creditability for the central bank and can be an effective tool through helping set forward expectations. This signaling is what the Fed is dong when they state that the zero interest rate policy will be in place for an extended periods. This should translate into lower forward rates. this works if the central bank has creditability and will follow through on the forward guidance. Of course, there will come a time when forward guidance will change and this can be a dangerous transition in the markets. Forward guidance also has to be contrasted with the idea of flexible inflation targets. How do you give guidance on your flexibility? ...(6) give the sovereign’s balance sheet a “facelift” and hence the political license and the balance sheet capacity to borrow. ...(9) which in turn is the surest possible way to generate the nominal income growth necessary for the private sector to deleverage. This cooperation framework is consistent with inflation (or nominal GDP) targeting frameworks at the zero bound. This fits with their earlier work which discusses central bank independence.The authors argue that central bank independence is a function of the environment. There are times when a central bank which is independent is needed and there are other times when cooperation with the fiscal authority is necessary. When there is rising inflation and there needs to be an independent body which can put the brakes on inflation, there is a reason for independence. However, when there is private delevering and the threat of deflation, there needs to be a cooperation with the fiscal authority. Monetary policy through private banks who are delevering will not be effective. In this case, buying debt directly from the Treasury will be workable. The direct link will finance the debt and get the desired effect with monetary policy in a liquidity trap. If growth continues to be slow, there will be greater pressure to use a more direct form of helicopter money. We are already doing this with QE but the form may be more explicit. This will be a strong signal to buy hard assets and stocks in even greater size. Currency wars - who are the warriors? There has been so much talk about currency wars but there has been little analysis on who would be the most active players. Finger pointing is one thing, but looking at those who are most active over time is a better approach. 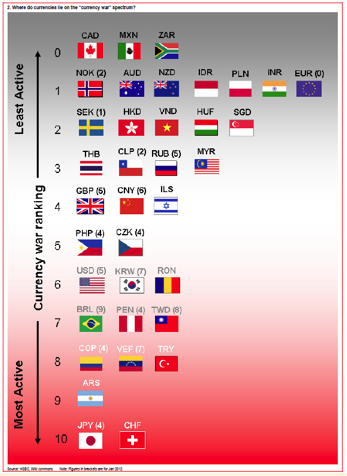 HSBC has done a good job of providing a list of those most active in the currency markets. Japan and Switzerland are the those that have been most active through either direct action or the accumulation of currency reserves. Asia, in general, has been more active at controlling currency rates. If you want to look at the warriors in this battle take a look at the bottom of this list. Is the super cycle over? There are more articles about the super cycle being over, even with commodity prices rallying so far this year. The last few years have not been good for commodity indices, as a measure of overall commodity prices. Equity markets have done much better and even fixed income has outperformed the asset class. If an investor is waiting for the good old days of the 2000's, he may have to wait a long time. Commodities price increases have lead to a response in supply which has dampened the potential increase in price. If prices rise, there will be a rationing response. It may not come immediately, but there will be a change in demand. Commodities follow a long cycle based on the response of supply to higher prices and the rationing of demand. There is some evidence that when commodities are increasing there will be less increase in equities. Commodities as an input in the production process will slow earnings growth or at least this is a story that can be applied in the long run. The current increase in stocks is partially tied with the fact that commodity prices have slowed. The China and emerging market growth story has changed. Growth rates have slowed and the need to accumulate hard assets has diminished. Stocks can be sold-off when there is less growth; consequently, we will see less upward pressure on price. we are seeing this with some of the industrial metals. We are also seeing less hording of gold as inflation fears have not been realized. When there is no supply shock from weather, commodity prices will slide. Oil has been rising but gains there is less fear about shortages. Any cycle may see the slope change. It is in the nature of cycles. It is important to realize that we are in a different phase with commodities, one of slower growth. In the 1990's and early 2000's the talk in the US was centered on the Greenspan put. If there was a fall in equities, the Fed would come to the rescue and solve the problem by lowering interests rates. It seems like the put strategies has been taken up by other central banks. There is a form of Fed hegemony whereby others want to follow what is believed to be successful policies. Unfortunately, the Greenspan put may have been a good reason for the housing bubble. 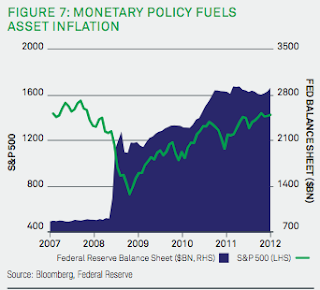 Central banks now want to drive asset prices higher in order to protect or enhance wealth. We are following the same strategies. If asset prices fall, the central banks will come to the rescue with a new liquidity plan. Forget about inflation, the central bank put is the dominant strategy. See the BOJ and the Nikkei link. The same with the ECB and Eurostoxx, and the BOE and FTSE. You could call this tail risk management if we did not want to be crass about a put strategy. The tradition or view that helicopter money is long and Turner argues that even Milton Friedman would be in favor of it in certain circumstances. Interestingly, he does not view it s useful for the UK; however, it is a tool that should be included in the policy discussion mix. He made his case through his paper presented at the Cass Business School. DEBT, MONEY AND MEPHISTOPHELES: HOW DO WE GET OUT OF THIS MESS? The slides for the presentation are included here. Finance Minister Aso - yen too weak? - what say G20? Finance Minister Aso suggests that the yen may have weakened more than it should have at this time. Japan does not want to be classified as a currency manipulator. The yen decline has now temporarily slowed bu has not really reversed course. Clearly, with the change in policy talk, there is a strong signalling component to the markets. The G20 finance ministers are meeting and have sated they will reaffirm their pledge to "refrain from competitive devaluations" and would be committed to monitoring "possible monetary-policy spillover". The G20 group has not mentioned Japan by name, but this is what the markets are thinking and Japan is the currency elephant in the room. The pace of decline may slow as investors try to assess the views of policy-makers, but the direction is still the same, a lower yen. Draghi - talking the euro down? ECB president Draghi commented last week that the strength in the Euro may pose a threat to the inflation outlook in Europe. As seen last year, the market hangs on the words of central bankers.He has also come out to say that currency war "chatter is not useful. He said that he will not try and influence the Euro. Of course, this is what he has done in the past through some of his comments. He really does not want the euro to go higher and he does not like that the euro has shown particular strength against the yen. President Draghi is now becoming the key central banker in the world. There seems to be more focus on him than Fed chairman Bernanke at the moment. Mark Carney - "flexible inflation targeting"
In hearings concerning his appointment as governor of the Bank of England, Mark Carney outlined his monetary policy views as "flexible inflation targeting". Flexible inflation targeting will now be the new buzz words for central bankers. Flexible inflation targets suggests that the inflation target should be hit in the medium term but in the shorter-term other goals need to be integrated which would allow for variation in inflation away from the target. These other goals would include welfare issues, employment gains, and financial stability. When goals are at odds, vary the horizon to account for such things as macro prudential regulation. This seems to make sense on the surface, but the flexibility rule means that there would not be any way to determine what would be the goals of the central bank. The goals and targets would be adjusted to meet different horizons and objectives with little clarity for the markets for what will be the overall goal of the central bank. Of course, central banks want to have the flexibility to undertake contingency planning but it is certainly not the case that this would reduce uncertainty. In fact, many central banks viewed that they had the mandate to be flexible. There has been very little talk that the financial crisis was a direct result of inflexible policies by central banks to hit inflation targets. 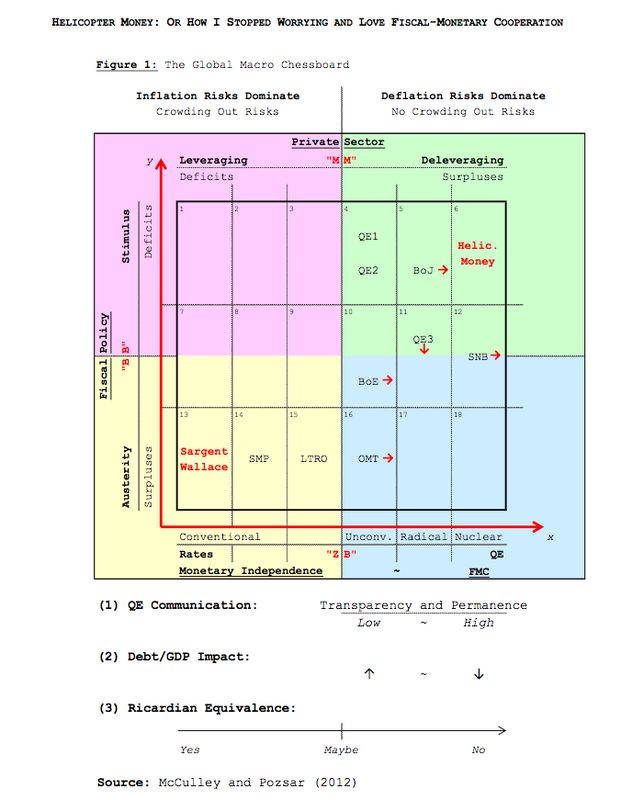 Flexible inflation targeting is dangerous. There will be more focus on what central banks say and on trying to read the signals of central banks and less on the real economy. How would this be a good thing? Every four years since 1997 the National Intelligence Council, the center for mid-term and long-term strategic thinking within the United States intelligence community, prepares a global trends report for the president. 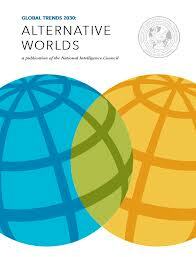 It is the intelligence community’s best assessment of critical drivers and global scenarios for the next 15 years. The latest report, Global Trends 2030: Alternative Worlds, should be required reading for any money manager who even minimally considers that a long-term view is important for allocation decisions. The very process of thinking about alternative futures offers anyone an opportunity to shape these alternative worlds and adapt to what is likely to be an uncertain environment. For all of the bemoaning of short-term focus on company earnings and investment performance, very little work is available on global trends. At best, Wall Street firms will present long-tern perspective for the year and produce occasional thought pieces, but the focus is usually on the current market. Who can blame the markets for their short-term focus given the poor skills of most forecasting to predict anything close to reality? Nevertheless, one of the best ways that excess returns can be delivered is through making asset allocations decision based on a longer-term view; nevertheless, at a time-frame of fifteen years Global Trends is outside the norm of most investor horizons. Successful investing is about seeing trends. Determining the future environment is necessary but there is a tension between the short-run and long-run. On the one hand, portfolio managers want to pick the best portfolio over the next quarter yet major gains will only be achieved through positioning for the long-run. Foremost, Global Trends is meant to be read. The color print, charts, and pullouts as well as the easy to read summary and overview make this work readily accessible. The language used is not your usual dry government document. The overview is broken into mega-trends, game-changers, and potential alternative worlds. This is not the vocabulary of the academic, but of the pop consultant business writer. The Global Trends is full of key information on where the world is potentially heading. Many of these themes have already been captured by market analysts. The emerging markets are going to become more important to the global economy. There will be shortages of key commodities. The rise of the middle class will change the demand for global products. Geopolitics will lead to stress in the Middle East and Far East. Of course, the investment professional has to convert this information into a portfolio. One of the key take-aways for today is that the risk premium for many markets are extremely low. Investors may not be compensated enough for the what may be significant upheavals around the globe. The period after WWII may have been special with risks generally on the decline. This may not be the case for the next fifteen years. The protection of a superpower may not be in place as the decline of the importance of the US continues. Factions across the globe is not in the interest of global investors. The work seems to be heavily influenced by the writing and presentation style of the McKinsey Global Institute. China oil demand has increased by 7.4% in the last year and it is now the second largest oil importer in the world. Saudi oil is moving east even though production is down to 9.2 million barrels a day which is the lowest in a year and less than the peak of 10.2 mb/d. There is a good reason for relatively tight oil markets with Brent prices up almost $8/ barrel this year. Open interest is at all time highs for WTI with over 1,665,000. Some academic work suggests that increasing open interest in futures is a good predictor of higher commodity returns. The open interest indicates the need for higher returns necessary to hold the futures. The yen has declined from 76.75 at the beginning of 2012 to current levels of over 93. The Nikkei index has moved from 9,000 to over 11,000. GDP has not yet moved positive in the fourth quarter but retail sales are up. The "Great Yen Decline" is starting to have an effect on the real economy. Since the equity rally started in the US in March 2009, the SPX has been up 121.4% while the NKY has increased by only 58.68%. In the last year, the NKY has outperformed and gained close to 17% versus 12% for the SPX. In the last six months, the differential has been in the favor of Japanese equities by just under 20%. The market believes these new policies will work. Is the "great derisking" over? The strong performance in equities over the last few months suggests that the great derisking of the last five years may be over. Of course, the stock market has increased significantly since the low of 2009, but we may be entering a new phase with bond yields reaching lows and starting to turn-around. Another phrase that can be used could be the "Great Rotation". Money is moving from bonds to stocks. Now this is not something new, but there seems to have been an increase in the pace of flows and performance differences. We should expect equities to do better in a post crisis environment. Since March 1, 2009, the S&P 500 (SPY) has increased about 120% while the long bond TLT has increased by about 32.5 percent for a differential of 88 percent over this period. The annualized difference is 22.28% versus 7.41%. Bonds out performed stocks over the last two years by almost double or 18 percent. In the last year, stocks beat bonds by 10%. Bonds were the place to be in 2011, bu the switch is on for equities. We seem to be moving to a new phase of risk-taking.